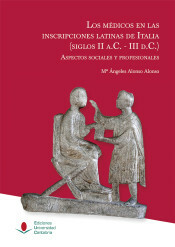 Mª Ángeles Alonso Alonso, Los médicos en las inscripciones latinas de Italia (siglos II a.C.-III d.C.), Santander, 2018. The gradual introduction of Greek medicine in Rome starting in the third century BCE has been considered to be a truly significant step in the history of medicine. This event allowed a new form of allopathy to spread while at the same time medical practices themselves evolved throughout the area that would come under Roman dominance. The resulting cultural interaction was possible thanks to Greek doctors who were responsible for disseminating cutting-edge medical theories and practices throughout the West. The present study focuses on the men and women who took part in the practice of the ars medica during the Roman Republic and Empire. This is accomplished by taking a close look at the epigraphic record, which provides an unparalleled resource that allows us to get to know these medical professionals. Epigrapic documents are useful in this regard precisely because they are linked to these professionals as individuals; therefore they supply—in a direct and objective way—vital information that would otherwise be inaccessible. Accordingly, the present study examines a corpus comprised of 311 epigraphs that describe medici and other medical professionals. The texts analyzed in the following pages come from both Rome and Italy at large and have all been dated between the second century BCE and the third century CE (Appendix 1). The book is divided into three main sections. The first part, which takes the status and identity of physicians as its main focus, examines the social circles in which doctors found themselves, the relationships that they forged both within and outside of the personal realm, and finally the person they projected in civic society. The second section analyzes the technical terminology employed throughout the inscriptions in order to look squarely at the medical profession and the types of work and clinical specialties that these individuals practiced. Finally, the third part turns to the physical spaces in which doctors, midwives, and medical assistants carried out their professional duties. On the whole, the present monograph provides a tour through the socio-professional context that characterized the medical profession throughout Roman antiquity. It does so by always placing the epigraphic records that mention the profession's members at the center of the discussion.